Contact us now for a free estimate on stunning landscape lighting design and installation. Outdoor lighting is a relatively inexpensive way to enhance the look of your property while increasing security. At Custom Electrical Solutions, our highly experienced team includes designers, planners, and installation experts for all aspects of landscape lighting. We welcome any size project from residential and commercial customers and we always offer free estimates. Whether you are lighting walking paths or steps, decks or docks, foliage or buildings, we promise your complete satisfaction. 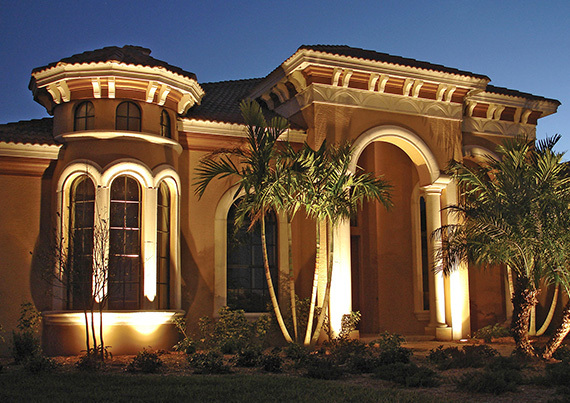 Your property will come alive at night, beautifully lit with the right type of outdoor lighting fixture for the task. Every project is customized to your needs and our work is always guaranteed. Consider what you want to achieve with your landscape lighting and meet with one of our technicians today for a free, no-obligation estimate.